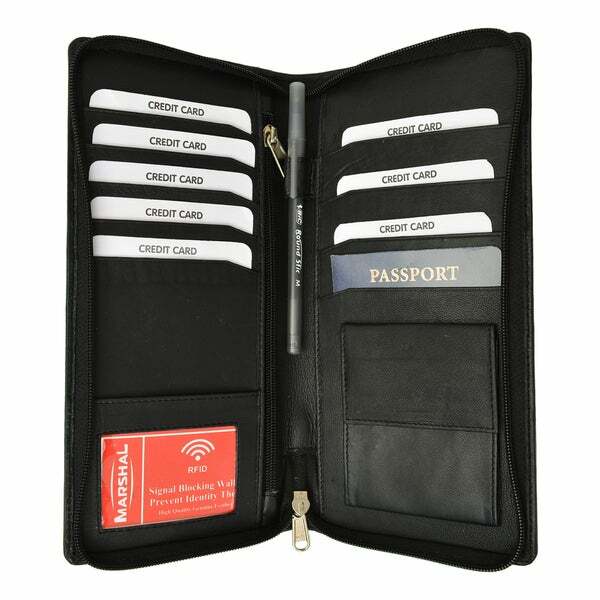 Premium Soft Leather One Long pocket on the outside for Boarding pass / Ticket RFID Blocking Wallet 8 credit card slots, coin pocket, ID window, passport holder pocket Measures:10.5in. H x 5in. L approx What is RFID. Radio-Frequency Identification) refers to the transfer of information from a small chip to an antenna. Why Does RFID Matter. Given technology's speed and ease to communicate information, RFID devices are now incorporated into credit cards and passports, without the consumer data protected. Around 100 million credit cards currently have contact less technology embedded into them. However, this number is expected to rise greatly in the next 2-3 years as credit card companies replace magnetic strips with new RFID enabled, contact less smart cards. What Does This Mean To You. RFID enabled Credit Cards would eliminate the need to swipe your credit card for purchases and would allow you to simply wave the card in front of a reader for payment. Although these cards seem to make transactions easier, it's so easy that some other folks are able to read your credit cards before you even take them out of your wallet. Paving the way for a new type of crime called Electronic Pick-pocketing. Should Credit Cards Be My Only Concern. Many Government IDs, Passports issued since October 2006, Employer ID, Driver's License, and Debit or Credit Cards are going to begin implementing RFID enabled chips. Since this is a fairly new technology, there are security concerns with RFID enabled cards as it makes credit card fraud or Identity Fraud more likely as other folks can scan for RFID waves and steal personal information. Prevent electronic pick pocketing, identity theft, and payment fraud by breaking/blocking the personal information being sent by radio waves from your credit cards, passports, and other ID cards - Use RFID blocking products. Made for a great gift idea for my nephew as he is an international traveler and the RFID Premium Leather Zipper Travel Credit Card Passport Wallet is stylish, but more important features added protection for his personal information, passport and credit cards! Exactly what I was looking for. Leather is quality and well made. From portable entertainment to must-have luggage, our trip-friendly gift guide has products for every jet setter.